The purpose of this question is to gain an understanding of the concepts behind reverse engineering and to understand what approaches may be taken to extract useful information from a binary file. First question: why is the output is blank? I've also tried to check the entropy to guess if the file is encrypted or compressed. Question two: these functions are used in the .bin file (so in the original source code), am I correct? Question three: How can I extract the data where the strings found are used? Question four: What useful information can be extracted from this file? At this point I am stuck. I'm a newcomer, so I would like to learn how to approach a situation in which I don't get useful information from a tool (like binwalk). So, if someone could suggest to me what steps should be taken in order to extract useful information (by this I mean pointing out concepts to understand, where to find information, useful resources, books and so on), and I would greatly appreciate it. If someone could show me how to proceed with this file, that would be great, so I can see directly some results and proceed with my study. Here is the file: http://www.3fvape.com/images/3fvape-blog-img/20150806-4384-xcubeII-upgrade/SMOK_X_CUBE_II_firmware_v1.07.hex The source file is in intel 32 bit .hex format and is for ARM Cortex-M0. "Intro to Embedded Reverse Engineering for PC reversers" by Igor Skochinsky provides an overview of what is involved in reversing firmware, and in "Embedded Devices Security: Firmware Reverse Engineering" Jonas Zaddach and Andrei Costin outline a general methodology for reversing firmware beginning on slide 31. Embedded systems often use MIPS or ARM processors, and by extension MIPS or ARM instruction sets. This means that being familiar with MIPS and ARM assembly will be very helpful when analyzing firmware for these systems. We cannot rely on hearsay to obtain the information required to analyze the firmware. Validity of information about the firmware must be proven by using empirical evidence. It is not enough to have a binary blob from a second-hand source and a processor name from a different question. This hex file is straight from the manufacturer of the device processor rather than from a second-hand source. It is also a newer version - v1.098 rather than v1.07. 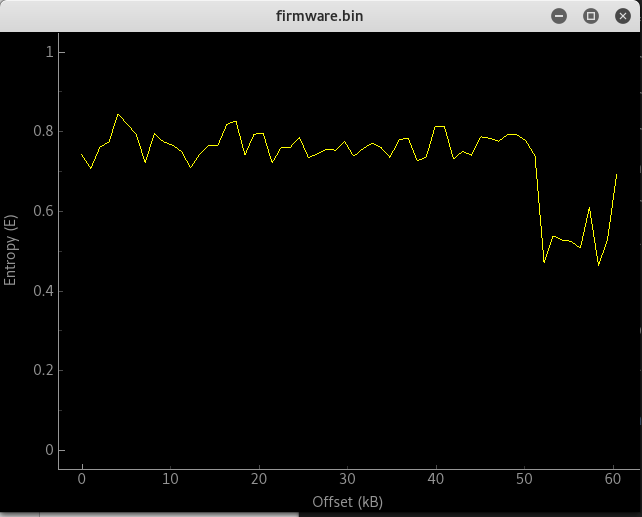 I decided to analyze the older firmware version (v1.07) since this is the version of the binary in the question. There are some interesting things in the pictures used to describe the upgrade process: the name NuMicro and the acronym ISP in the tool name, the term DataFlash, a reference to something called APROM, and most importantly, the part number: NUC220LE3AN. What "part" is this a number for? A Nuvoton-developed microcontroller based on ARM's Cortex-M0 processor. Nuvoton is kind enough freely share technical documentation for the NuMicro NUC220 series, including the datasheet and the technical reference manual, in addition to various software tools and training materials (click on the "Resources" tab at the top of the NUC220LE3AN product page). The NuMicro NUC200 Series 32-bit microcontrollers is embedded with the newest ARM® Cortex™-M0 core with a cost equivalent to traditional 8-bit MCU for industrial control and applications requiring rich communication interfaces. The NuMicro NUC200 Series includes NUC200 and NUC220 product lines. The processor can execute Thumb code and is compatible with other Cortex®-M profile processor. 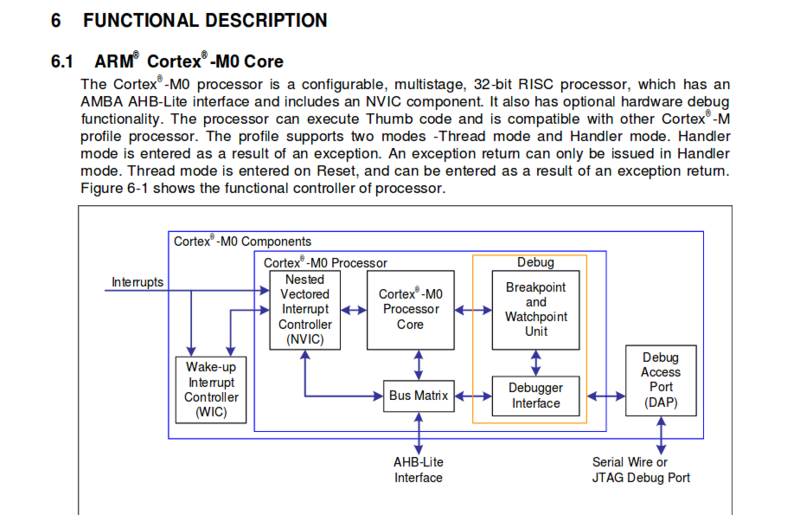 Note that the processor is an ARM Cortex-M0 Core and not ARM Cortex-M0+ Core, which has a different instruction set. the 32-bit Thumb instructions BL, DMB, DSB, ISB, MRS and MSR. What is "Thumb code" and the "Thumb instruction set"? The Thumb instruction set consists of 16-bit instructions that act as a compact shorthand for a subset of the 32-bit instructions of the standard ARM. Every Thumb instruction could instead be executed via the equivalent 32-bit ARM instruction. However, not all ARM instructions are available in the Thumb subset; for example, there's no way to access status or coprocessor registers. Also, some functions that can be accomplished in a single ARM instruction can only be simulated with a sequence of Thumb instructions. At this point, you may ask why have two instruction sets in the same CPU? 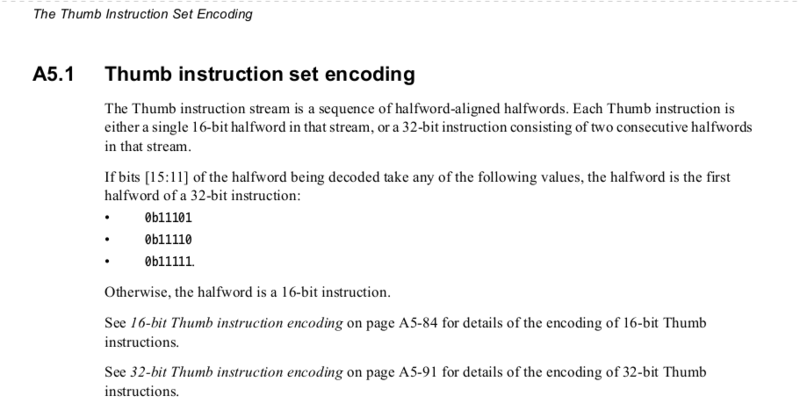 But really the ARM contains only one instruction set: the 32-bit set. When it's operating in the Thumb state, the processor simply expands the smaller shorthand instructions fetched from memory into their 32-bit equivalents. The difference between two equivalent instructions lies in how the instructions are fetched and interpreted prior to execution, not in how they function. Since the expansion from 16-bit to 32-bit instruction is accomplished via dedicated hardware within the chip, it doesn't slow execution even a bit. But the narrower 16-bit instructions do offer memory advantages. The Thumb instruction set provides most of the functionality required in a typical application. Arithmetic and logical operations, load/store data movements, and conditional and unconditional branches are supported. Based upon the available instruction set, any code written in C could be executed successfully in Thumb state. However, device drivers and exception handlers must often be written at least partly in ARM state. The NuMicro NUC200 Series only supports little-endian data format. To summarize: the code in the firmware binary will consist of little-endian 16-bit ARM Thumb instructions plus a few 32-bit Thumb2 instructions to be executed by a 32-bit ARM Cortex-M0 processor implementing the ARM 16-bit Thumb instruction set with support for Thumb2. The NuMicro NUC200 Series flash memory consists of program memory (APROM), Data Flash, ISP loader program memory (LDROM), and user configuration. Program memory is main memory for user applications and called APROM. User can write their application to APROM and set system to boot from APROM. 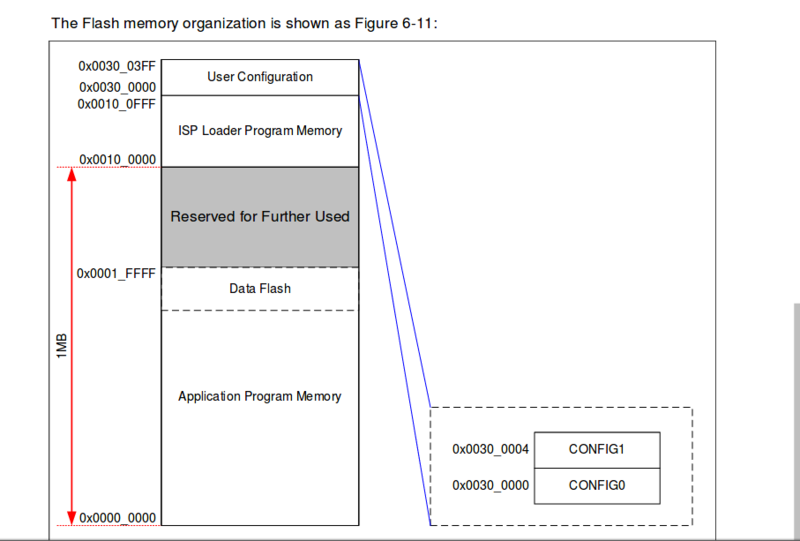 ISP loader program memory is designed for a loader to implement In-System-Programming function. LDROM is independent to APROM and system can also be set to boot from LDROM. Therefore, user can user LDROM to avoid system boot fail when code of APROM was corrupted. ISP provides the ability to update system firmware on board. Various peripheral interfaces let ISP loader in LDROM to receive new program code easily. The most common method to perform ISP is via UART along with the ISP loader in LDROM. General speaking, PC transfers the new APROM code through serial port. Then ISP loader receives it and re-programs into APROM through ISP commands. We know that the space from 0x0000_0000 to 0x0001_FFFF = 131071 bytes, which is 128 KB, and this is the region to which the binary from the hex file will be flashed to using the upgrade tool. Above that there is a block of memory from 0x0002_0000 to 0x0010_000 which is labeled "Reserved for Further Used". The size of this "Reserved" space is 0x0010_0000 - 0x0002_0000 = 0xE0000, or 917504 bytes. This is almost 1 megabyte of reserved space. The 128 KB reserved for APROM makes up 12.5% of the address space between 0x0000_0000 and 0x0010_0000, but is represented as being larger than the ~1 MB "Reserved" block. This is very strange. There is also no documentation of this reserved block anywhere in the technical reference manual that I could find. If one had physical access to the device, perhaps the contents of flash memory could be dumped and analyzed to find out what lies in this region. Since the firmware binary is written to space in flash memory reserved for user applications, it seems unlikely that the firmware binary contains kernel code, bootloader code or a filesystem. This is different from router firmware, which tends to at the very least contain kernel code. NuMicro is a Taiwan-based company. We will see why this is potentially relevant shortly. The output of strings can be used to quick heuristic in determining if the firmware is encrypted/compressed. If there are no strings in the output, it is a good indicator that the entire file is obfuscated somehow. 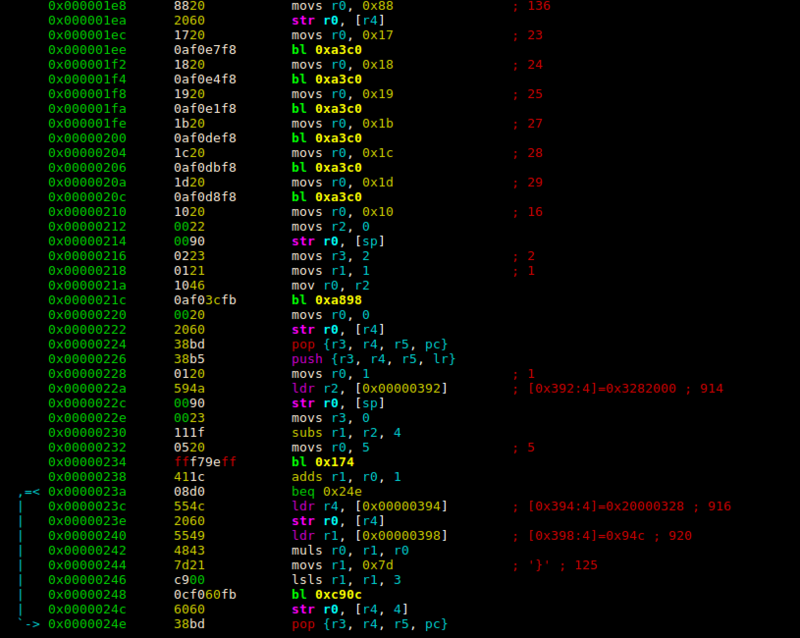 hexdump with the -C argument can be used to provide some context for the strings i.e. where in the binary they are relative to code and relative to each other. In other words, are the strings packed together in a single block, or are they scattered throughout the binary? The answer can provide clues about the layout of the firmware. The firmware, the upgrade tool and the microcontroller are all developed by Nuvoton, a Taiwanese company. Perhaps there are sequences of traditional Chinese characters in the binary as well. -- I am Pentium of Borg. Division is futile. You will be approximated. I cannot read these characters, so I do not know what language they are from. Maybe it is just gibberish. So how should the binary be disassembled using r2? 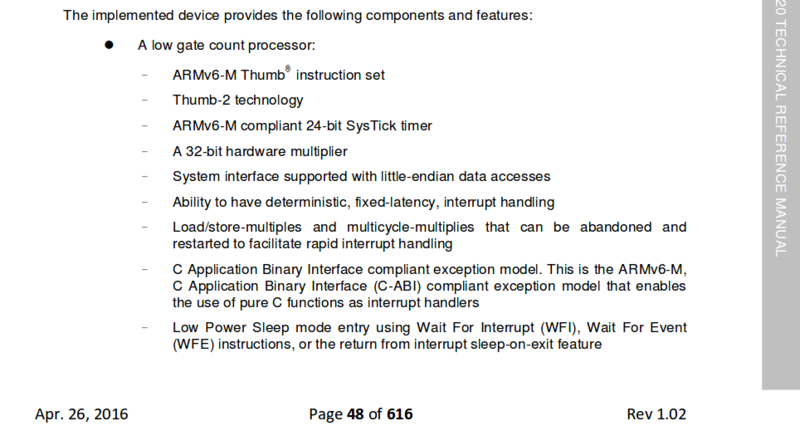 Are any there any special arguments or commands for 16-bit ARM Thumb instructions + some 32-bit Thumb2 instructions? -b16 is asumed for thumb, not because the instruction size or the register size. Its an exception to make things simpler. Because its just a mode of the cpu. 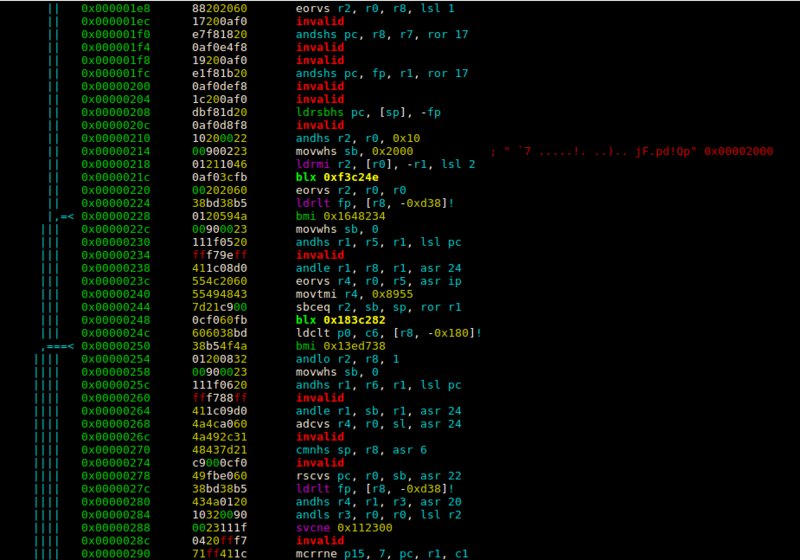 -b16 sets thumb2 mode in capstone disassembler (as well as in gnu). Thumb2 contains 2 byte and 4 byte instruction lengths. Thumb was only 2. But thumb and thumb2 are binarynl compatible, so it makes sense to use thumb2 here, unless the cpu doesnt supports it. From what i understand from ual is that this ist just a syntax, and this symtax should be ready in capstone. Capstone knows nothing about code or data. It just disassembles. Obviously this is totally different. To analyze the disassembled code, one must be familiar with the ARM Thumb instruction set and assembly, and probably ARM more generally (CPU design, registers, etc.). A good starting point appears to be the Azeria Labs series of tutorials . The ISP upgrade tool is a MS Windows PE32 executable binary. This can be reverse engineered to determine how the flashing process takes place. Hopefully the approach used here proves useful for your future firmware RE endeavors. Analyzing firmware poses its own set of challenges because of the close relationship between it and it the hardware it is designed to be embedded in. Since the design and architecture of the device determines the layout and content of firmware, firmware sometimes cannot be reversed without access to the device, or at the very least knowing the instruction set architecture of the device. Not the answer you're looking for? Browse other questions tagged binary-analysis firmware arm hex binary or ask your own question.